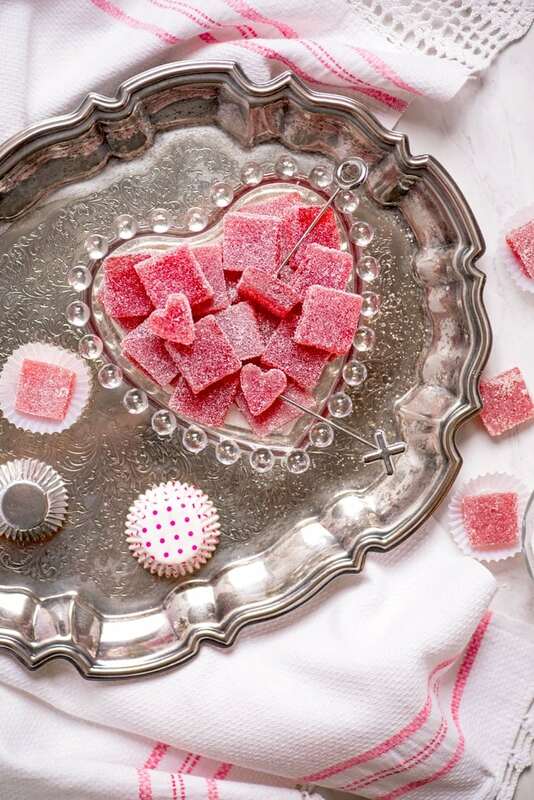 Strawberry Pate de Fruit, also called fruit jellies, are an inexpensive candy to make from scratch. 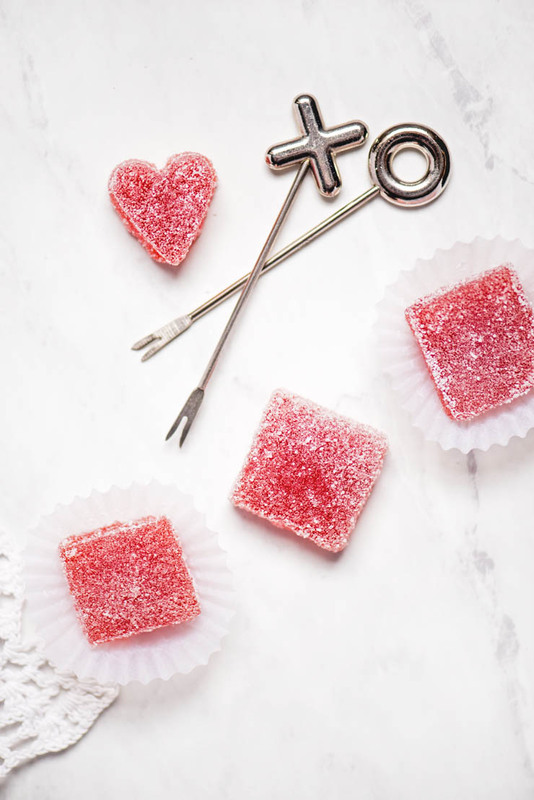 It just takes a few simple ingredients and a candy thermometer to make this French confection at home. When I was very young, Tysons Corner Mall was the place to go shopping. Under one roof there were two sprawling floors of stores, all with shiny window displays. Malls aren’t very popular these days, but I still have fond memories of eating lunch at Hot Shoppes and running behind my mom as she walked at breakneck speeds. Mom always seemed to be in a hurry and for my little child legs it was hard to keep up. But if I kept up and didn’t misbehave, the reward at the end of the day was a treat from the candy stand. You know those citrus slice jellies? I loved their fruity flavors and the way the grit of the sugar contrasted the soft jelly texture. So that’s what I would request EVERY TIME! About twenty years ago I was flipping through a French Laundry cookbook at my in-laws and discovered a recipe for pate de fruit. First, at the time I had no idea the French Laundry was a fancy pants restaurant. Second, I had no clue pate de fruits were a famous french treat. In my mind, candy came from factories or quaint mom and pop shops at the beach. 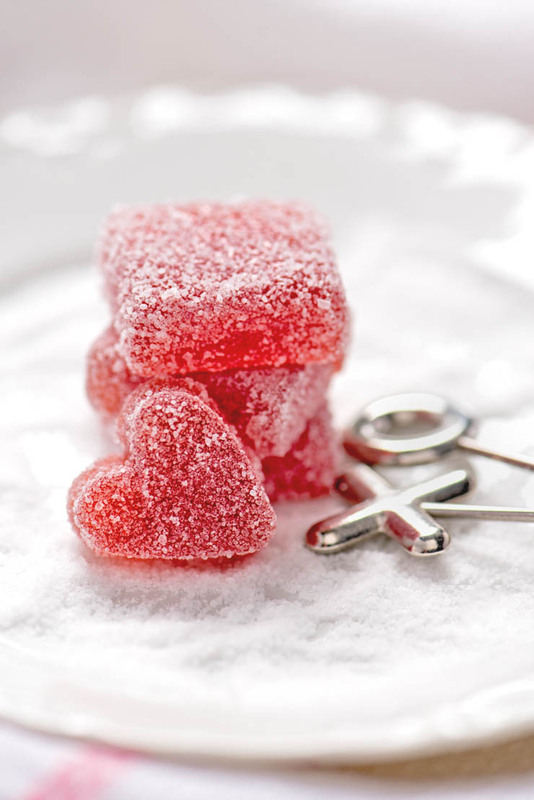 Who knew that these little confections could be made at home? Now I make my fruit jellies rather than buy them…. strawberry, pineapple, orange….you name a flavor, I’ve probably tried it! Pate de fruit are actually quite easy to make but you do need a candy thermometer. 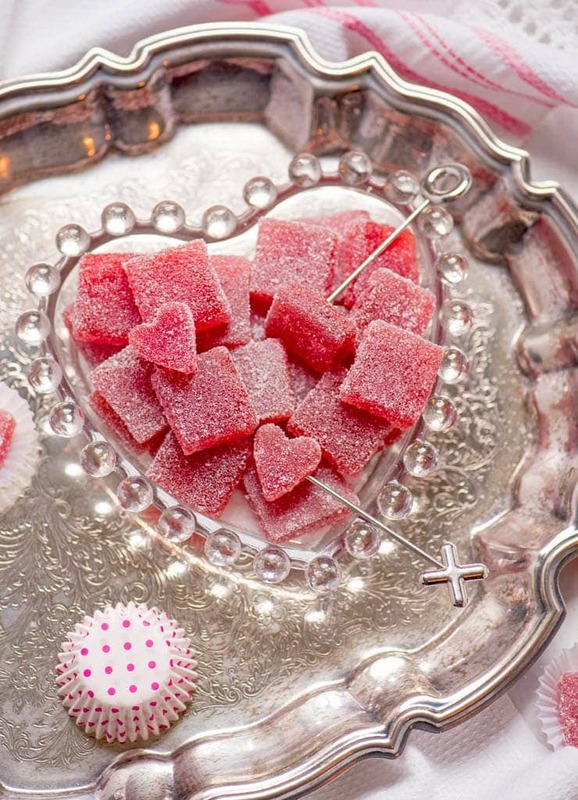 Otherwise, this recipe for strawberry pate de fruit is pretty simple. It contains strawberry puree, sugar, unsweetened apple sauce, lemon juice, powdered pectin and a splash of red wine for added color and flavor. The tricky part is really in the waiting. As the mixture boils you stir and stir and stir until you think your arm will fall off. But with time, the water cooks out of the syrup thus achieving a jelly consistency. Pour the candy into a pan and then wait again for it to set up…usually overnight. Obviously, this is a not a last minute snack attack kind of treat. But it does make a fantastic treat for holidays like Valentines Day, Christmas and Easter. Just one recipe makes 64 candies and they keep indefinitely if stored in an airtight container in a cool, dry location. What I love about these strawberry pate de fruit is the intense fruity flavor. They are soft and chewy with a deep berry color that is sure to please both kids and adults. 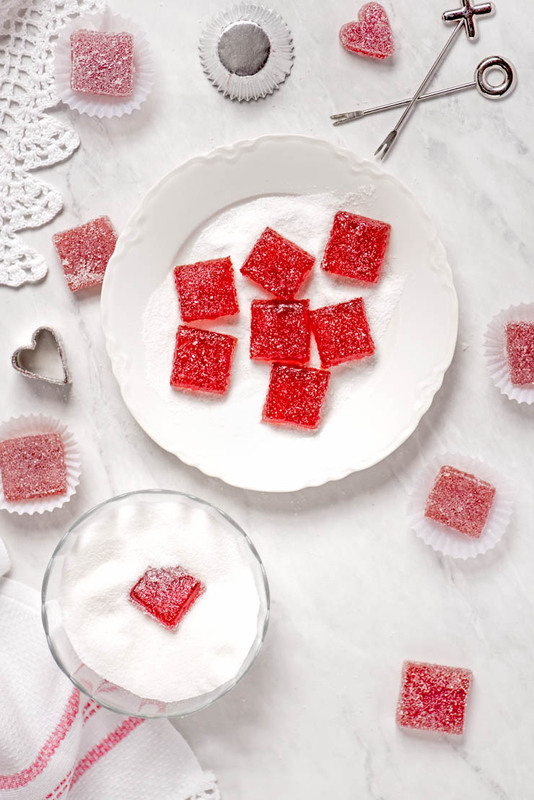 These sweet and fruity strawberry pate de fruit are an easy to make homemade candy. 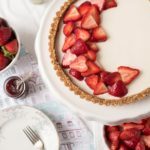 You can use fresh or frozen strawberries, making this a great recipe for holidays and parties throughout the year. Line an 8 by 8 inch square pan with two crisscrossing pieces of parchment paper. I find it helpful to use clothespins to make sure the paper stays put. In a deep 3 quart pot, combine sugar, strawberry puree, apple sauce, lemon juice and pectin. Bring to a boil over medium heat, stirring often with a heatproof spatula or wooden spoon. Once the mixture has been cooking for about 10 minutes, carefully attach a candy thermometer. At this point you'll want to stir continuously to keep the bottom of the pan from burning. Cook until the thermometer reaches 225F. Turn off the heat and stir in the red wine. Turn off the heat and stir in the red wine, then immediately pour the syrup into the prepared pan. Let sit 4-8 hours until set. Generously sprinkle a cutting board with granulated sugar and then turn out the pate de fruit onto the cutting board. Gently peel off the parchments paper. It will be sticky, so work from one corner and peel slowly. 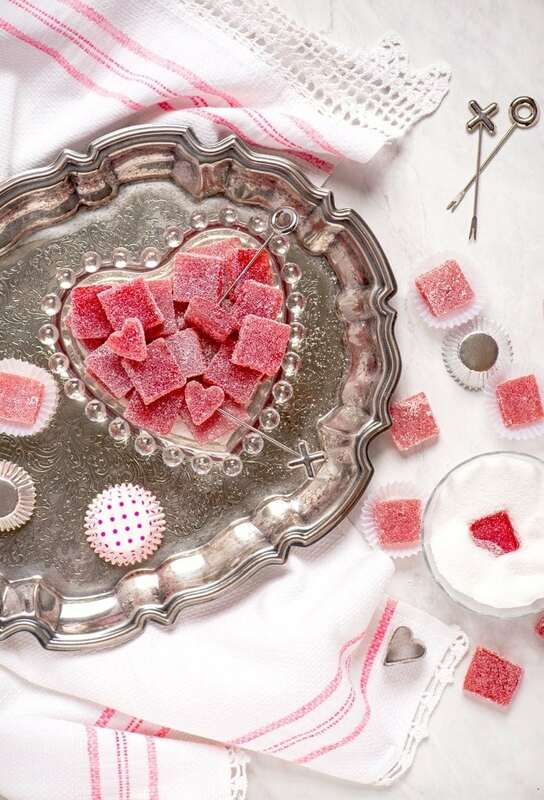 Using a large sharp knife, cut the candy into one inch strips and then one inch pieces. You will have to wash and dry the knife between cuts. Dredge the pate de fruit squares in more sugar. Store in an airtight container with parchment between layers. 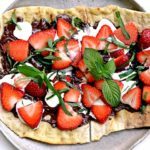 I used frozen strawberries for this recipe. I let them thaw in a bowl and then very lightly mashed them. Then I strained them through a fine mesh sieve, leaving behind as much white colored pulp behind as possible. This recipe results in a soft but firm candy. You can cook the mixture longer up to 245F but the higher the temperature, the more likely the mixture is to burn, so use caution. If you make jelly often, I suggest buying the jar of powdered pectin rather than the boxes. It's easier to use and more cost effective. These would be WAY too dangerous for me to have at home! Ha! But pretty sure I need to make them anyway 😉 They look and sound divine! They are dangerous! I’ve eaten so many! Did share some with Kevin’s coworkers. It’s so great your mom would make these for you! Your kids will love them! It’s like making jam but boiling too long. You’ve got this Tammy! I LOVE pate de fruit but have never made it before. This recipe has put them on the radar to me to make. I’m so excited to try this! It’s so easy that once you start making them, you’ll want to make every flavor possible! Ooh! Just look at that pretty pink colour! 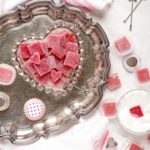 Your pictures are incentive enough for anyone to go into the kitchen and make these candies pronto! Absolutely love these! Well, I knew one of the two things you learned. I did know that the French Laundry was a restaurant just because I’m addicted to cookbooks and they have one. The treats look so good. Perfect for Valentines Day or really anytime of year you want something special. My mouth is watering looking at your photos. I’m also obsessed with cookbooks…so when I go to someone else’s house I peruse their collection! You can tell a lot about a person from their cookbooks! Red Wine and Strawberry Gummies? YES, girl, I like your style! They look absolutely delicious and would make such a pretty Valentine’s Day gift! Thanks Kiki! If only there was enough red wine to get a girl tipsy! LOL! I have never attempted to make sweets like these, but you make it seem so easy! They would be a great little Valentines Day gift as well! They really are easy. It just takes a lot of patience to stand over that hot pot and keep stirring. But I’ve never had a pate de fruit recipe fail (thank you candy thermometer) while cake recipes can be so fickle. 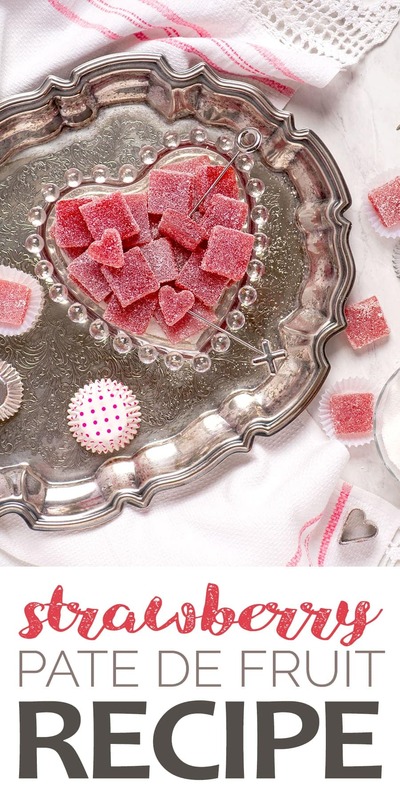 This is such a great dessert for Valentine’s day! They make a great presentation and taste too. OMG these little strawberry treats look amazing and so easy! 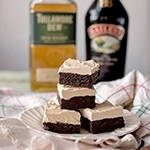 I’m pinning to make this on the weekend. Oh wow. THis is real Valentine’s Day treat. Looks so delicious and beautiful I love the colour. I’m saving this recipe to make it for my hubby. He likes candies! Your hubby will love them Natalie! I love this little cuties. I wonder did the wine gave them this beautiful color, or strawberries? Great question Ruchi. Some of both. Because of the apple sauce in the recipe, the color is more orange red without the wine. Still pretty but not red red. The wine does deepen the color but it also deepens the berry flavor.